A chronological list of activities in the style of the “C. Contributions to Science” section in the new (2015) NIH biosketch. Cleft lip and palate surgery. While completing my doctorate, I began what was to become a long involvement in experimental and clinical studies of cranial morphology. Concerns about possible iatrogenic effects of cleft lip and palate repair and in particular, clinical observations suggesting that cleft palate repair inhibits growth of the maxillofacial skeleton date back to the 1940s. This unparalleled series of studies identified technique-specific variations in subsequent maxillofacial growth and form leading to the reconsideration/modification of surgical techniques. I was a co-investigator in all of these studies. I participated in the design of the studies, assisted with surgical procedures, was responsible for the execution of the studies and collection of data, performed all statistical analyses, contributed substantially to the writing of the manuscripts, and reviewed, revised and approved the final manuscripts as submitted. 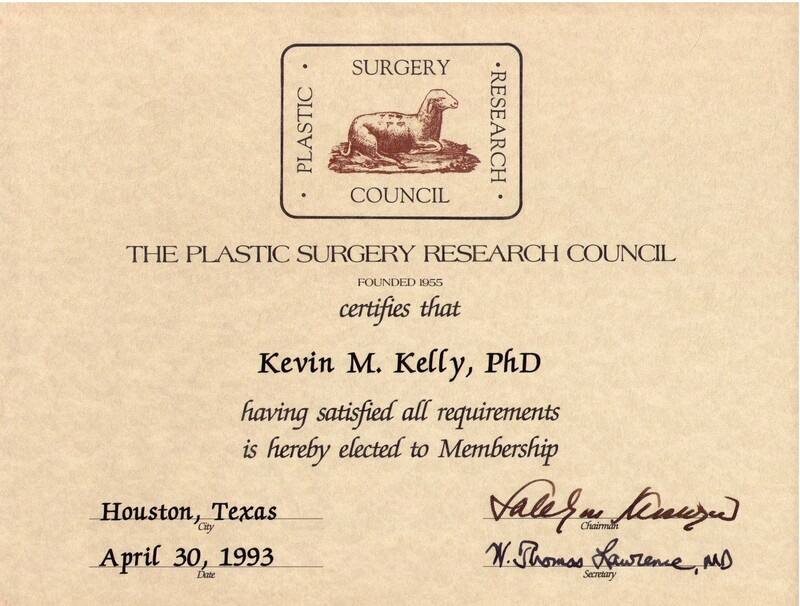 These publications are representative of the body of work that lead to my election in 1993 to the honorary position of Associate Member of the Plastic Surgery Research Council. Bardach J, Kelly KM (1988) The influence of lip repair with and without soft tissue undermining on facial growth in beagles. Plastic and Reconstructive Surgery, 82:747-755. Kelly KM, Bardach J (1988) Facial growth in beagles with repair of an isolated cleft palate. European Journal of Plastic Surgery, 12:66-73. Bardach J, Kelly KM (1990) Does interference with mucoperiosteum and palatal bone affect craniofacial growth? An experimental study in beagles. Plastic and Reconstructive Surgery, 86:1093-1100. Kelly KM, Bardach J (2012) Biological basis of cleft palate and palatal surgery. In: FJM Verstraete, MJ Lommer (eds. ), Oral and Maxillofacial Surgery in Dogs and Cats. Saunders: Philadelphia, pp. 357-364. Kelly KM (1990) Gm polymorphisms, linguistic affinities, and natural selection in Melanesia. Current Anthropology, 31:201-219. Clark JT, Kelly KM (1993) Human genetics, paleoenvironments, and malaria: relationships and implications for the settlement of Oceania. American Anthropologist, 95:613-631. Kelly KM (1996) IGHG3 G and the pathogenesis of hyperreactive malarious splenomegaly. Medical Hypotheses, 46:135-139. Kelly KM (1999) Malaria and immunoglobulins in Pacific prehistory. American Anthropologist, 101: 806-809. Deformational plagiocephaly. The success of the 1992 “Back to Sleep” public health campaign was followed by an epidemic increase in the incidence of infants with deformational changes of the cranium. Although first described in 1979, in 1995, the FDA sought to regulate the orthotic cranial molding helmets devices being used to treat deformational plagiocephaly. I was the lead investigator on a pair of clinical studies submitted to the FDA, and subsequently published, that demonstrated orthotic cranial molding helmets as a safe and effective nonsurgical alternative to invasive intracranial surgical remodeling. These efforts led to the classification of cranial orthoses as a Class II neurology device and subsequently to the approval of the first regulated cranial orthosis. Follow-up studies have focused on the etiology and incidence of deformational plagiocephaly. By providing evidence of safety, effectiveness, etiology and incidence, this body of work has changed the standard of medical treatment of nonsynostotic cranial deformations. I was the primary investigator or a co-investigator in all of these studies. I participated in the conceptualization and design of these studies, performed all statistical analyses, contributed substantially to the writing of the manuscripts, and reviewed, revised and approved the final manuscripts as submitted. Kelly KM, Littlefield TR, Pomatto JK, Ripley CE, Beals SP, Joganic EF (1999) Importance of early recognition and treatment of deformational plagiocephaly with orthotic cranioplasty. American Cleft Palate-Craniofacial Journal, 36: 127-30. Kelly KM, Littlefield TR, Pomatto JK, Manwarring KH, Beals SP (1999) Cranial growth unrestricted during treatment of deformational plagiocephaly. Pediatric Neurosurgery, 30: 193-199. Littlefield TR, Kelly KM, Pomatto JK, Beals SP (1999) Multiple-birth infants at higher risk for development of deformational plagiocephaly. Pediatrics, 103: 565-69. Littlefield TR, Saba, NM, Kelly KM (2004) On the current incidence of deformational plagiocephaly: An estimation based on prospective registration at a single center. Seminars in Pediatric Neurology, 11: 301-304. Rural health. Rural populations are disproportionately affected by public health issues. The Keokuk County Rural Health Study (KCRHS) was a population based, prospective cohort study of health status and environmental exposures in a large, stratified, random sample of residents in the rural Iowa county of Keokuk. Over the span of nearly 20 years, the KCRHS and KCRHS-derived studies provided data that has documented many of the suspected health issues and identified new public health concerns. I was a data analyst/co-investigator in all of these studies. I participated in or reviewed the design of these studies, performed all statistical analyses, contributed to the writing of manuscripts, and reviewed, revised and approved the final manuscripts as submitted. Chrischilles E, Ahrens R, Kuehl A, Kelly K, Thorne P, Burmeister L, Merchant J (2004) Asthma prevalence and morbidity among rural Iowa schoolchildren. Journal of Allergy and Clinical Immunology, 113: 66-71. Sanderson WT, Madsen MD, Rautiainen R, Kelly KM, Zwerling C, Taylor CD, Reynolds SJ, Stromquist AM, Burmeister LF, Merchant JA (2006) Tractor Overturn Concerns in Iowa: Perspectives from the Keokuk County Rural Health Study. Journal of Agricultural Health and Safety, 12:71-81. Stromquist AM, Merchant JA, Zwerling C, Burmeister LF, Sanderson WT, Kelly KM (2009) Challenges of conducting a large rural prospective population-based cohort study: the Keokuk County Rural Health Study. Journal of Agromedicine. 14:142-149. Exposure assessment. Understanding the nature and extent of environmental contaminant exposure is essential to assessing the risks posed to human health. These studies have advanced our knowledge of occupational contaminant exposure by assessing the comparability of exposure assessment methods from various labs, identifying previously undetected sources of contaminants, and ascertaining task-specific differences in contaminant exposure. I was a co-investigator in all of these studies. I reviewed the design of the studies, performed or confirmed all statistical analyses, and reviewed and approved the final manuscripts as submitted. Reynolds SJ, Thorne PS, Donham KJ, Croteau EA, Kelly KM, Lewis D, Whitmer M, Heederik DJJ, Douwes J, Connaughton I, Koch S, Malmberg P, Larsson BM, Milton DK (2002) Comparison of endotoxin assays using agricultural dusts. American Industrial Hygiene Association Journal, 63: 430-438. Reynolds SJ, Milton DK, Heederik D, Thorne PS, Donham KJ, Croteau EA, Kelly KM, Douwes J, Lewis D, Whitmer M, Connaughton I, Koch S, Malmberg P, Larsson B-M, Deddens J, Saraf A, Larsson L (2005). Interlaboratory evaluation of endotoxin analyses in agricultural dusts – comparison of LAL assay and mass spectrometry. Journal of Environmental Monitoring, 7:1371-1377. Total Worker Health. I was co-investigator on a pair of statewide surveys (RealIowans.com): 1) a survey of employed Iowans that provided employment sector estimates of health status, prevention behaviors, and productivity measures by employment status (self-employed, employed by an organization or currently unemployed, but seeking employment) and 2) a survey of Iowa employers that provided employment sector estimates of employee health and safety programs. Results of the employee survey showed that higher quality of life measures and practicing more prevention behaviors are strongly associated with lower absenteeism and higher presenteeism scores. At the same time, we found that Iowa employers are implementing less than 30% of the 12 IOM-recommended employee total health management components. Responding to this need, our team produced and evaluated a series of eight translational videos. The Total Worker Health Essentials videos uses a peer-to-peer approach to help small businesses tailor integrated health and safety programs, practices and policies into their workplaces. I participated in the conceptualization and design of the survey studies, performed all statistical analyses, contributed substantially to the writing of the manuscripts, and reviewed, revised and approved the final manuscripts as submitted. I reviewed, revised and approved content of the translational Total Worker Health videos and assisted with evaluation of the videos by community stakeholders. Rohlman R, Campo S, Hall J, Robinson EL, Kelly KM. (2018) What could Total Worker Health® look like in small enterprises? Annals of Work Exposures and Health. 62 (S1): S34–S41. Tamers SL, Goetzel R, Kelly KM, Luckhaupt S, Nigam J, Pronk N, Rohlman DS, Baron S, Brosseau L, Bushnell T, Campo S, Chang C-C, Childress A, Chosewood C, Cunningham T, Goldenhar LM, Huang TT-K, Hudson H, Linnan L, Newman L, Olson R, Ozminkowski RJ, Punnett L, Schill A, Scholl J, Sorensen G. (2018) Research Methodologies for Total Worker Health®: Proceedings from a Workshop. Journal of Occupational and Environmental Medicine. 60 (11): 968-978.